The Affordable Care Act "basically puts a penalty or a tax on employers for every new job they create." 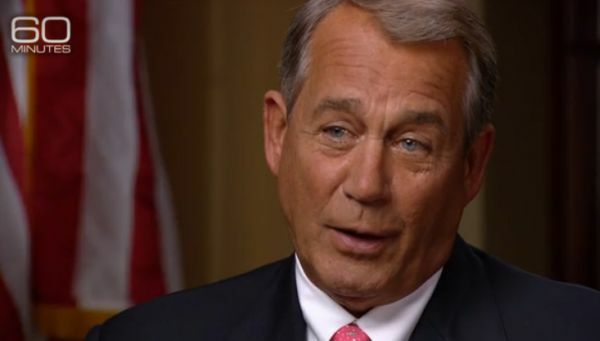 — John Boehner on Sunday, January 25th, 2015 in an interview on CBS' "60 Minutes"
By Louis Jacobson on Thursday, January 29th, 2015 at 5:56 p.m.
As a new, entirely Republican-controlled Congress kicked into gear this month, House Speaker John Boehner and Senate Majority Leader Mitch McConnell sat for an interview on CBS' 60 Minutes. The pair addressed many topics, including one of the biggest sources of friction between Republicans and President Barack Obama: the Affordable Care Act, the major health-care overhaul sometimes called Obamacare. "All the regulations that are coming out of Washington make it more difficult for employers to hire more people," Boehner said in the interview. "Chief amongst those, I would argue, is Obamacare, which basically puts a penalty or a tax on employers for every new job they create." What this means is that the rule is never supposed to apply to small businesses with fewer than 50 workers. So when Boehner said Obamacare "basically puts a penalty or a tax on employers for every new job they create," it’s a significant exaggeration by the numbers. How much of an exaggeration? Let’s start with larger businesses. According to a widely tracked survey of employers conducted by the Kaiser Family Foundation, 94 percent of firms with 100 or more workers already offer health insurance to their employees. That means 6 percent of those big companies will need to start offering health coverage. The U.S. Census Bureau says there are 101,642 firms with at least 100 employees, so that means roughly 6,000 big firms will have to change their behavior because of the employer mandate. Meanwhile, the Kaiser study found that for firms with 50 to 99 workers, 90 percent already offer health insurance. Census data doesn’t use the same size ranges; the census counts 494,170 firms with between 20 and 99 workers. That still means that fewer than 50,000 firms would need to offer coverage. As an example, if 200,000 businesses have between 50 and 99 workers, then 20,000 will need to start offering coverage due to the law. If you combine these two figures, that means perhaps 26,000 private-sector firms will have to start offering health coverage or else pay penalties this year or next year. That’s hardly a trivial number -- but it’s important to remember that this is not a large proportion of all American employers. The Census Bureau found 5,726,160 employers nationally, so less than one percent of all companies will have to start offering coverage due to the law. Boehner spokesman Michael Steel emphasized to PolitiFact that the speaker didn’t "say ‘all’ employers." All this said, independent experts told us that Boehner could have raised some valid concerns about the employer mandate if he’d offered a less sweeping claim. • While businesses with fewer than 50 workers are exempt from the individual mandate, they may feel an impact nonetheless. If these companies offer insurance, the law institutes a range of pro-consumer regulations that could increase health insurance premiums. "This is not the same thing as a tax for every job created, but some firms may view it negatively," said Christine Eibner, a senior economist at RAND Corp. Eibner added that such regulations could cut both ways -- the new rules could potentially lower premiums for certain firms, such as those with older workers. • As we noted in our previous fact-check, the law’s employer mandate is likely to drive some companies to cut the hours of some workers so they can get them under the 30-hour-per-week floor that triggers the health-insurance requirement. While we found that critics of the law had exaggerated the number of workers who have already suffered that fate, we found it plausible that such work-hour cuts could happen to several hundred thousand workers. Of course, it’s worth remembering that the costs from the law don’t stop with the employer -- whenever new taxes or regulations are imposed, companies typically pass them on, including to their workers. "Most economists believe that firms ultimately pass the costs of benefits onto their workers in the form of reduced wages or other compensation," Eibner said. "If benefits become more generous, workers’ wages won’t rise as quickly. In this sense, the economic burden of these provisions is more likely to fall on workers than firms, especially over time as wages adjust. Some workers may be willing to accept that trade-off because they value having access to health insurance." Boehner said the health care law "basically puts a penalty or a tax on employers for every new job they create." The law does impose penalties and regulations that could increase costs for some companies, though the impact depends heavily on the individual employer’s situation (and could actually result in lower costs for some companies). However, the law will force only a tiny fraction of employers -- less than 1 percent of companies by our estimate -- to start offering coverage when they did not do so before. That’s something that wouldn’t be clear to someone who heard Boehner’s comment. The statement is partially accurate but leaves out important details or takes things out of context, so we rate it Half True. Published: Thursday, January 29th, 2015 at 5:56 p.m.